Owning a home is typically the single biggest investment for most Americans. Thus, it’s only natural and prudent to protect it in the best possible way. Investing in the best home security system for your needs is a key way to protect your home and family. However, the market is overflowing with options and offers, and it can be hard to find the one that’s right for you. We reviewed hundreds of home security systems available on the market as of February, 2019, and created a simple list to help you choose the best home security system for you and your home. Each home security system was evaluated across several factors including cost, response time, installation complexity, features, quality of customer service, style, ease of use and more. This rating system gives you a full understanding of the key features and functionality across each system. We also evaluated these companies for the title of best home security system in 2019. Read on to find out who took home the top scores. 3.1 How important is home security & automation when moving into a new home? 3.2 What are the most important factors to consider when choosing a home security system? 3.3 What features are most important for my home alarm system? Established in 1994, Brinks Home Security is a professional security company based in Dallas, Texas. The business went through a rebranding phase in 2009 as Broadview Security because of ownership changes. However, in 2018, MONI Smart Security obtained the name rights for Brinks and brought the original name back to the market. The business did more than re-branding since the most recent name change. A plethora of new and smart technologies were implemented in their security systems and Z-wave devices. Furthermore, the company changed their official catchphrase to “Be Sure Sure,” because it corresponds to their new form of technology known as ASAPer. ASAPer is an advanced monitoring technology service that comes as a standard upgrade to all Brinks security systems. According to the company, ASAPer is ten times faster than most alarm monitoring services in the U.S.
Brinks Home Security creates a security dream team by using major players like Brinks, LiveWatch, and Moni. This process opened up a lot of new security options for customers. For example, they can integrate their home security system with the Nest Secure alarm system if you have one. Cost Recovery Fee – for the provision and maintenance of hardware, firmware, and software. Paper Statement Fee – costs that derive from mailing statements. However, these costs are avoidable if you turn on Auto Pay or Electronic Billing from your Brinks account. Termination Fee – these costs are covered through the company’s DocuSign cancellation procedures. They depend on your contract, and thus they are different on the case to case basis. A standout feature of this home security system is the response time, which distinguishes Brinks from other home security companies. Brinks says the ASAPer responds to emergencies in 30 seconds or less. Another major plus for Brinks Home Security is the installation process, which was designed to be as simple and easy as possible. The company completely preconfigures the equipment according to your preferences before it’s shipped. Therefore, the only thing you need to do when the equipment arrives is to place it in the appropriate places, connect it, and activate the system. The equipment is 100 percent wireless, meaning you won’t have to drill or change the structure of your home in any way. On the other hand, if you don’t want to bother with this process yourself, you can use the Brinks Pro Install services. The installation fee for this additional service is $199 if you pay upfront or $10 per month. 24/7 Monitoring – is full coverage that lets the ASAPer service alert you through SMS, voice, or email based on your configuration. If they don’t get feedback from you that it’s a false alarm, they will dispatch the police. Tamper Protection – is another useful feature because it allows for full protection against break-ins in the home security system itself. LiveVoice® Assist – is one of the unique features offered by this home security company, because it allows you to use your control panel as a walkie-talkie. That means that you can communicate with the LiveWatch central monitoring center at all times. Smartphone Control – you can arm, disarm, and check on video streams through the app on your phone. Live Video Streaming – enables you to remotely monitor your home at all times. Cloud Video Storage – you can record and save important video clips on your cloud. Brinks won the first place award for customer service and satisfaction according to J.D. Power. According to company policy, the comfort and happiness of customers always comes first. That’s the reason why they created their version of the Customer Bill of Rights. Brinks home security even has a dedicated phone number to text suggestions and feedback. The whole design of the home security system is impressive. If you’re a fan of a simple and minimalist style, Brinks equipment will fit right in with your home. Every piece is white, small, and easily to manage. Furthermore, it’s elegant and sophisticated enough that it won’t detract from your overall home décor. We give Brinks five stars for style and design. The system is very easy to install. The company’s mobile app, Alarm.com, gives you centralized, remote control over the whole system with a user-friendly interface. It’s available for iOS, Android, Blackberry, Windows phone, Pebble Watch, Kindle, Apple TV, Amazon Fire TV, and the Apple Watch. You can also remotely access the system through your account by logging into m.alarm.com. Additionally, the Brinks home security system comes with a two-year guarantee, which you can extend for a lifetime for an additional fee. Furthermore, there are impressive integration features for many popular smart home devices, including Nest Thermostat, Amazon Alexa, and Google Home. Keith Nellesen and Todd Pedersen co-founded the Vivint Smart Home Security Company in 1999, which is headquartered in Provo, Utah. The first official name of the business was APX Alarm Security Solutions, because they originally only sold security systems. In 2006, the company was reinvented as a home monitoring provider. This transition was made possible with the help of a Goldman Sachs’s credit line of over $515 million that also enabled the expansion of the company into Canada. Later that same year, the company acquired a central alarm monitoring station from Criticom Monitoring Services, a subsidiary of Protection One. By February of 2012, the company rebranded on the market as Vivint. The co-founders also paired up with Peterson Partners and Jupiter Partners, extending their services to deploy severe weather alerts and remote security access to their customers. By August 2013, they also started offering wireless broadband. The next year, Vivint bought a cloud storage startup called Space Monkey, founded by Clint Gordon-Carroll and Alen Peacock. 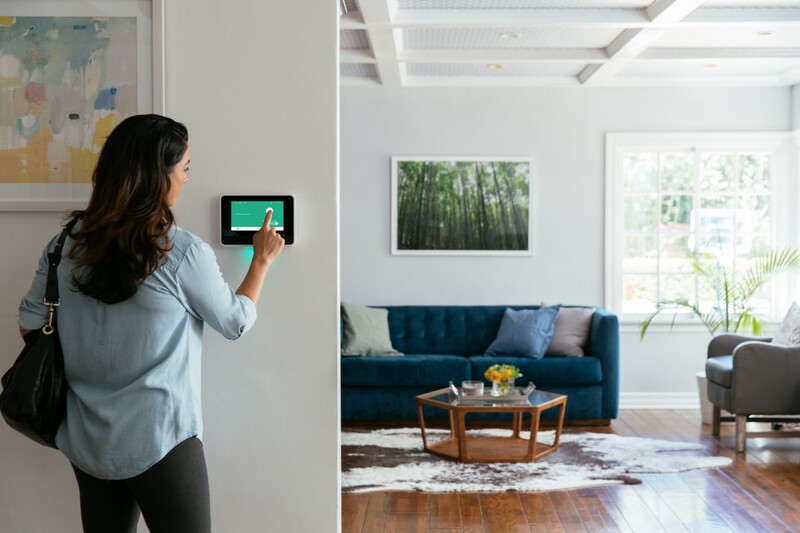 Today, Vivint is a private company offering smart home services in the U.S. and Canada, with over 1.3 million customers in both countries. In fact, the company is so popular that it was listed as one of the Fast Company “World’s 50 Most Innovative Companies” in 2017, and it was 46th on the Forbes list of “America’s Most Promising Companies” in 2013. The Blackstone Group acquired Vivint in 2012 for more than $2 billion. Vivint offers highly customizable packages for its customers, which is one of the most appealing options currently available on the market. Thus, by giving customers almost complete freedom to create a package that suits the needs of their homes at competitive prices, it’s understandable why the company is so popular. The activation fee for the security system package is $99, and the monthly monitoring fee is $49.99. If the cancellation policy isn’t activated within this timeframe, there’s a possible penalty charge for early termination. All Vivint packages are drafted as a standard 42-month monitoring contract, depending on the location. This is a bit of a tricky question for Vivint, because according to experiences by users so far, Vivint’s response time can vary significantly. According to the company, their official response time is under 10 seconds. When it comes to installation, it’s best to have a professional handle this task. 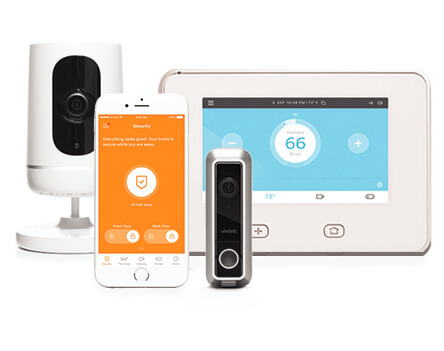 Vivint is a professionally-installed and monitored home security system with a home automation platform. A team of three to four installers will need to install cameras, the system panel, and additional equipment (depending on what’s included in each custom package). 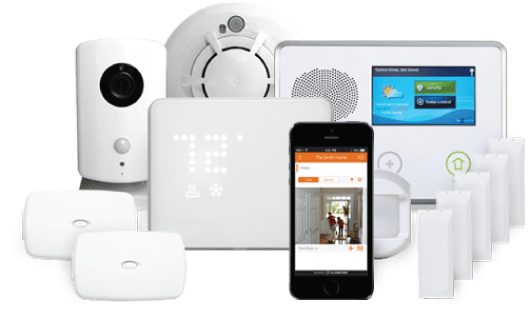 After installation, they can instruct you about how to use your new home system no matter where you’re located, which is an key advantage of choosing a Vivint home security system. Perhaps some of the best things about Vivint is the 24/7 professional monitoring and lifetime equipment warranty. The company contacts you for every unauthorized break-in alert so you can confirm or deny the emergency before police are contacted. Additionally, Vivint also integrates with Amazon Echo, which allows you to control certain sytems features through voice commands. Vivint was awarded the J.D. Power award for “Highest in Customer Satisfaction with Home Security Systems.” However, once we examined customer service reviews online, the high price of the service and Vivint’s customer service itself were common complaints for some customers. In fact, government action was recently taken against Vivint because the company had issues with alleged misrepresentation of provided services and hiring unlicensed company agents. On top of that, some customers encountered troubles with service cancellation, installation of faulty equipment, and overly pushy reps. The equipment is rather stylish for anyone who wants a clean and sophisticated design. The 7-inch color LCD touchscreen that looks like a mounted tablet on the wall was designed by a former Nike marketing executive. All in all, we were very impressed with the simple style of the equipment. Vivint is one of the pioneers of home automation technology on the market today. Therefore, the panel and the app they feature for the use of this system have been fine-tuned make it extremely easy to use. For example, each of the automation features we mentioned above can be activated with the app, no matter where you’re located. The app is available in the app stores for both iPhone and Android devices. 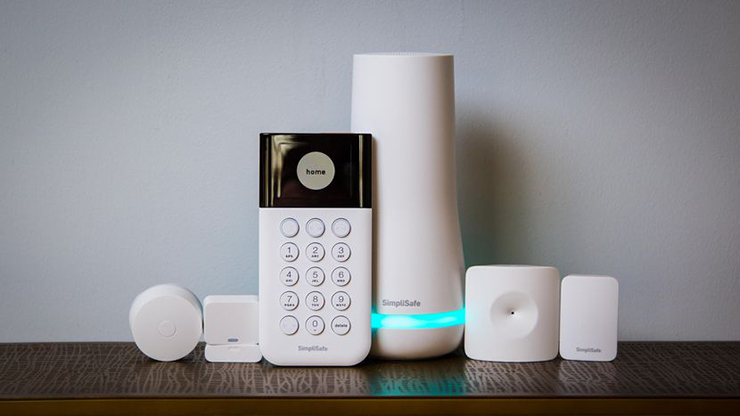 The SimpliSafe Security System company was founded in 2006 by then-Harvard Business School students, Chad and Eleanor Laurans. Since Chad Laurans holds an additional degree from Yale, where he majored in electrical engineering, designing a security system was a welcome challenge when some of their friends from Cambridge were robbed. The company started with initial investments from angel investors, and by 2013 had a $38.5 million in revenue. The next year, Sequoia Capital invested $57 million in the company. Today, SimpliSafe has over 300,000 customers. Since last year, the private equity firm Hellman & Friedman has a controlling interest in the company. SimpliSafe, similarl to Frontpoint, features a DIY installation option. SimpliSafe offers a 60-day test period, during which you can decide want to keep their monitoring service and equipment. When it comes to the equipment, they offer an a la carte customizable approach, which means you get to choose the features you want and build a suitable home security system for your home. Since everything is wireless, you don’t have to worry about complexities in installation. Following are the packages featured on the SimpliSafe online store, as of the publication of this article. All of the above come with 24/7 alarm monitoring. The company offers two main monitoring plans. The standard option is $0.50 cents per day, and the interactive option is $0.83 cents per day. SimpliSafe has the most impressive response time of all home security companies we reviewed. Their timeframe for response in under 10 seconds, which we must admit is quite remarkable. Because of the wireless equipment, the installation process is pretty straightforward; you just have to choose where to put the devices. They come with an instruction manual, which is filled with recommendations to help you pick the best spots in your house. They’re easy to move around the house or to take them with you if you move. Mobile alerts – once you install the app on your phone, you get to stay connected with alerts from the motion sensors in your home. Furthermore, you can also follow the flood sensors, carbon monoxide detectors and smoke/heat detectors. Of course, this is all depending on the package you chose. A note of importance, if you want to get the SimpliSafe app, then you would have to subscribe to the more expensive monitoring plan. One category where SimpliSafe has gotten somewhat dissatisfying reviews is customer service. Most users are not very happy with the way dispatch calls from the monitoring system function for false alarms because they can frequently result in additional charges. Moreover, the overall opinion is that the company’s customer service is not very helpful when it comes to fixing problems and recurring usage issues. Despite the fact that almost all major home security companies feature amazing designs, SimpliSafe equipment is quite elegant and unique in its appearance. For example, the equipment comes in either white or black options. Every unit looks smooth and sophisticated, and it will blend in beautifully in most homes, no matter the style or decor. The remote control is one of the features of this home security system so that you can arm and disarm the alarms with the keychain or the app. The SimpliSafe app lets you control your SimpliSafe security system from anywhere in the world. It’s available for iPhone and Android. ADT home alarm systems has a long and colorful history. Back in 1863, Edward A. Calahan came up with a brand new technology called a stock ticker. Once he understood the financial potential, he formed the Gold and Stock Telegraph Company in 1867 in order to exploit the technology. A few years later, the company also developed a messenger system that sent messages for the stock exchange. However, it was a stroke of luck or misfortune when he caught a thief in his home one night. That’s when Calahan came up with the idea of a telegraph-based alert system. By 1874, 57 district telegraph delivery companies came together and became “American District Telegraph” or ADT. The company’s first acquisition happened in 1909 when Western Union and ADT were taken over by the American Telephone & Telegraph Company (AT&T). That allowed ADT to expand into new lines like fire alarms and home security systems. Then, it became a publicly traded company in the 1960s. However, the company ran into some monopoly troubles in areas of the U.S., which made them adopt a fixed national price list. The second acquisition happened in 1987, when Lord Ashcroft bought the company as the fourth-largest company in the U.S. security market. A reverse takeover occurred in 1997 when Tyco purchased ADT. Today, ADT is valued over $2 billion, and it’s part of the same home security system family that includes Brinks. ADT offers alarm monitoring services in 35 countries. The headquarters today are in Boca Raton, Florida and they have over 8 million customers in the U.S. and Canada. The company holds a 25 percent market share of the residential market and 13 percent of the small business market. 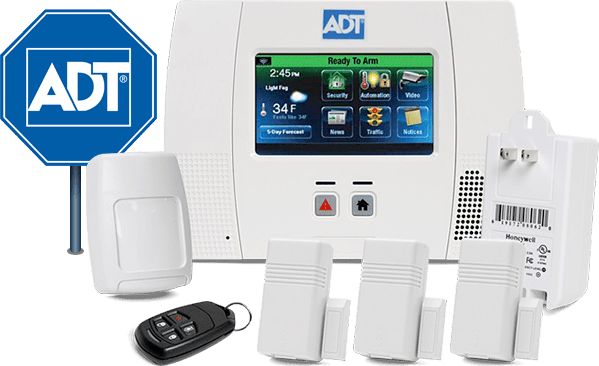 ADT is one of the oldest and most recognizable home security brands in business today. The traditional package – this one is pretty basic, and it’s priced at $125 for an upfront equipment fee and $28.99 for monthly monitoring services. However, since it’s a little bit more expensive than the other basic packages on the market, it compensates with a lot of additional features. In this package, you get: a wireless keypad entry, 24/7 professional monitoring, four-door and window sensors, fire, carbon monoxide and flood-monitoring services. The control package – this is set at a $125 upfront equipment fee and $36.99 monthly for service monitoring. In this bundle, you get everything from the traditional package along with home automation, remote web and mobile access, and email and text notifications. The video package – this is the company’s premium offering, and it’s priced at upfront an cost of $125 and $52.99 monthly for live monitoring. You get everything from the control package, as well as a Remote Secure Video upgrade. According to the official and published Terms and Conditions of the ADT agreement, which can vary from user to user, the minimum duration period is 36 months. They do note, however, that additional charges may apply in areas that require guard response for municipal alarm verification. So, it’s best to keep that in mind and read the fine print before you sign the contract. The ADT Go app costs an extra $9.99 (plus tax) as a monthly recurring fee. The company also offers discounts and promotions, so it’s a smart idea to consult with one of their representatives to find out how you may save money on a new system. The ADT response time is 45 seconds, which is not that impressive if you take a look at Brinks or SimpliSafe response times. Therefore, this isn’t the strongest feature of ADT home security systems. ADT requires professional equipment installation but the good news is that there’s no additional installation fee, because it’s already included in the upfront package costs. According to the largest number of users, the main problem with ADT customer service is difficulty with the cancellation process. If you like clean, white, streamlined equipment, then you’re going to love the ADT look. Every piece of equipment from the cameras to the displays has a very modern and futuristic appearance. The equipment is relatively small and can easily blend into every home. The system is reasonably easy to use and understand. ADT Pulse is ADT’s home and business automation system, which you will get it you purchase a package that offers the automation system. This allows you to remotely arm and disarm your home’s security system, display video monitoring, control temperature and lights, receive alerts and custom notifications, as well as lock and unlock doors. Frontpoint is relatively new in the market, but it has a very traditional approach to home security. That can be an excellent combination for some users in the U.S. that prefer the traditional monitoring combined with new technology. The company was founded in 2007 in Vienna, Virginia by co-founders Aaron Shumaker, Chris Villar, and Peter Rogers. The estimated annual revenue of Frontpoint is $18M and they have over 275 employees. Because it’s a relatively new company, they offer some fantastic deals and packages for customers. Plus, they have an impressive customer approval rating of almost 98 percent. One of the most appealing things about Frontpoint is their DIY approach, which can be hard to find in professional home security systems. The overall impression is that even though the Frontpoint systems have very good selling points, they also rely on long-term contracts and can be a bit pricey when it comes to monthly monitoring. Frontpoint offers six equipment packages as of the publication of this report, and each of them is highly customizable according to need. The prices listed here are with a $300 discount, which you can get with a 36-month monitoring agreement. The monthly monitoring plans offered by Frontpoint all require a three-year contract. The Protection Plan is $34.99 per month, the Interactive Plan is $44.99 per month, and the Ultimate Plan is $49.99 per month. All of them are based on 24/7 professional monitoring and 100 percent wireless and cellular coverage with an automated system check. Frontpoint contract requirements and possible early termination fees are stated in the monitoring agreement. The average response time for Frontpoint is 30 seconds, which is relatively average. It’s not the worst response time, but it’s far from the best. This category is where Frontpoint shines as a company. In fact, they have the best DIY home security system that you can install yourself. Since everything is wireless, you won’t have any complicated installation issues. If you need any additional tips on where to place the devices, you can go to their website for more help and guidance. The company also includes a Quick Start Guide with every package that explains every step of the installation in detail. Mobile alerts – you get alerts in the app for almost everything in your home, including motion sensors as well as flood sensors, carbon monoxide detectors, and smoke/heat detectors. Plus, you can also customize the alerts according to your needs. Wireless – as mentioned, everything is wireless, which makes it easy for you to adjust and move the equipment as necessary. Live video stream – sent to mobile phones, tablets, and computers. Disaster protection – for environmental sensors in addition to intrusion sensors. Remote control – via Frontpoint keychain and mobile app. This is another category where Frontpoint wins points from their customers. According to most users, Frontpoint is very timely and responsive, and they give great advice and suggestions regarding packages and monitoring plan options. Moreover, users seem to like the professionalism and attention to detail displayed from the Frontpoint customer service team. The Frontpoint equipment looks very sophisticated, simple, and elegant. Since you’re the one placing it around the home, you’re going to have no problem fitting it into the decor. Once installed, the Frontpoint security system is pretty easy to use, since it doesn’t require any additional learning curves. 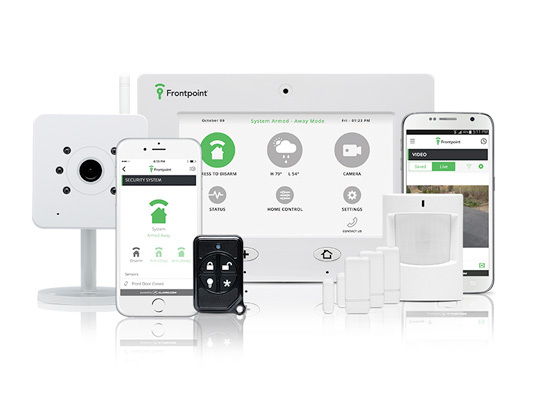 Because of the home automation feature, you have the option to install the Frontpoint app and gain remote control over your security system, alarm history and visitor activity. The app is compatible with iPhone and Android users. The Protect America alarm systems company was founded in 1992 in Austin, Texas, and the headquarters of the firm still remain in their hometown. The business grew substantially from 1992 to 2001, with over 200,000 security systems installed across America. In 2005, the company created the first monitored self-installed security system business model on the market. This security business model was the foundation for the emergence of “DIY security companies” in the home security market. In 2010, under advisement from Imperial Capital, Rockbridge Growth Equity LLC from Falcon Investments acquired Protect America. This acquisition was estimated at $100 million. Two years later, the company expanded into the Canadian market and now has over 400,000 customers. Protect America was listed as the 13th biggest job creator in the state of Texas according to Inc. magazine. Protect America also holds a spot on SDM magazine’s top 15 U.S. security system providers list in 2014. The company also provides public security system advice on U.S. television networks and Protect is known for its philanthropic attitude and local involvement. They partnered with Michigan State University and the University of South Alabama to aid students in their pursuit of a more conscious society by participation in local area charities. Protect America has a more direct relationship with the Austin Police Department, by providing financing for police initiatives and updating the department’s security equipment. Protect America equipment has a lifetime warranty. The standard contract length for alarm monitoring with the company, for a new customer, is 36 months. On another note, according to the company’s Terms and Conditions, you can cancel the agreement by returning all of the equipment within 15 days of the initial shipment date from Protect America. Plus, customers have 30 days from the date of purchase to return additional equipment for a full refund. If, however, you want to cancel the agreement after the initial 15 days, the company offers you a transfer option, which essentially means you transfer the ownership to another person. The other option is to pay cancellation fees, but they depend on the particular case and contract obligations. In short, you’ll need to pay the rest of your contract even if you cancel it. According to online reviews, the response time for Protect America is around 12 seconds, which is pretty fast. That puts the company in line with some of the top response times in the market, along with SimpliSafe, Vivint, and Guardian. As with all other DIY home security systems, Protect America delivers the equipment to your door and lets you handle the rest. Of course, they will provide you with a user manual and additional tips if you need them, but since the equipment is wireless, you shouldn’t have any complex installation issues. They say the complete installation should take less than an hour. The company provides a dedicated customer service line along with a personal home security portal, where you can log in and ask for help if you need it. However, the main issue most customers encounter with this company is the aggressive sales tactics used by the company’s reps.
Another recurring problem is the cancelation process, as with any company that requires you to sign an agreement. However, most customers that don’t need to go through cancelation are rather happy with the customer service. The equipment is wireless, which means you can place it anywhere. The compact and sophisticated white equipment blends in with any home decor. SMART Connect is a free home security smartphone app developed by Protect America that allows remote control from anywhere. It provides a complete overview of the home, from the locks on the doors to the live video stream. If in any moment an alarm is triggered, you’ll receive a notification from Protect America. The app is available for both Android and iOS. Moreover, this home security system makes everything simple for the user because of the full automation and integration features with many smart home devices such as the Amazon Echo Dot. 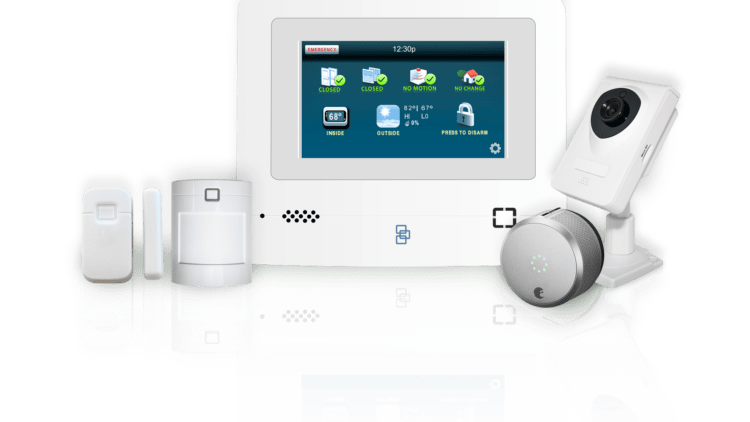 The Link Interactive company was founded in Utah in 1952, and it’s famous on the home security market for high-level intruder protection and sophisticated home automation features. In the last couple of years, the company started offering additional security solutions like modern, easy-to-use equipment, which integrate well and offers smart home compatibility. As with most security companies that reinvent their approach to home security, they have embraced the DIY approach. Therefore, the company allows you to build your own packages depending on your personal needs. Their major selling point is that the company features 24/7 central-station monitoring and cellular-based automation. Link Interactive is famous for its high-quality customer service and has an A+ rating with the Better Business Bureau. The Link Interactive equipment comes with a three-year warranty period. You can sign an agreement for monitoring services which can last 12, 24, or 36 months. The company does offer a 30-day money back guarantee on their services and equipment, which is more than what other companies in this business tend to offer. So, if you’re the type of person who likes to try a product before you buy, then Link Interactive might be an excellent fit for you. The company even sends the equipment with a prepaid postage label, which you can use to send back the equipment if you’re not satisfied. However, let’s assume you’re using the equipment for two years while you’re bound in a three-year contract and you want to cancel their services. In that case, you’ll still have to pay 75 percent of the fees remaining on the contract. Therefore, the 30-day evaluation period is the wisest and most economical time to back out of any contract with Link Interactive if you change your mind. The official response time for Link Interactive is 20 seconds, which puts the company right in the middle. Whether that matters is if an additional 10-second response time makes a difference to your peace of mind. If so, we recommend you look at SimpliSafe, which has an average response time of 10 seconds. But it could be worse: Xfinity Home has a 45-second average response rate. Link Interactive is big on DIY installation, which means you have to do it all yourself. Some handy people love this approach, others not so much, but it usually doesn’t matter because the process is quite simple anyway. If you have any trouble figuring out where devices should be placed, you should check out the installation video on the Link Interactive website. The company also offers the “2 Way Voice on All Panels” feature, which is a very useful addition on the features list. This way you can talk with the company’s Central Monitoring Station directly through the panel, and cut down the response time in half. In general, the customer reviews regarding the quality of service are positive, which can sometimes be hard to find in the home security business. Even though it’s less sever and issues with a contract cancelation, most people report longer waiting times and limited hours of support. Link Interactive customer support is open from 8am-10pm CST Monday through Friday, and from 9am-6pm CST on Saturdays. Customer support is closed on Sundays. The equipment is very simple and easy to use since it’s wireless. If you’re a stylish person that likes a more sophisticated look, then you might have a problem with the boxy look of Link Interactive’s equipment. It’s not as slick and as modern as some other home security systems. Link Interactive combines home security and home automation through its mobile app, which is available for both Apple and Android users. The app is quite simple and intuitive, and furthermore, it allows you to remain in complete control of your home security. You can lock or unlock doors, adjust the temperature, follow a live video stream, or turn on/off the lights. Nest Labs was co-founded by former Apple engineers Tony Fadell and Matt Rogers in 2010. The company wasn’t founded as a home security company per se, but rather as a home automation research lab that became very famous, very fast. By January, 2014, Google acquired Nest Labs for $3.2 billion, and since then, the’ve launched a whole array of new and innovative products on the market. Another quite important step was the partnership with Brinks Home Security for a monthly maintenance plan, so that the Nest Protect system can be professionally monitored. By February, 2019, the Nest Guard received an update that added Google Assistant compatibility. That allows the system to effectively double as a smart speaker, the same way Google Home works with general voice commands. Another advantage to choosing Nest Secure is their liberal policy toward monitoring contracts. In fact, since the company partnered with Brinks, they added the option of 24/7 professional monitoring, which is offered at a discount with a three-year contract. However, if you’re someone that doesn’t prefer long-term commitments, you can instead use their month-to-month option. You can review Brinks’s 24/7 monitoring services and prices in the Brinks review at the beginning of this report. It’s the same as Brinks Home Security. See the Brinks review at the beginning of this report for more details. Setting up the devices around the house is very simple and straightforward. Since everything is wireless, you only need to decide where to place the equipment without any complex installation procedures. For all the strong sides Nest Secure has, the quality of customer service is not one of them. In fact, unsatisfied customers generally have a problem getting through to skilled technicians when they have technical issues. From all the home security system available on the market today, there is not one that looks more elegant and sophisticated than Nest Secure. Every piece of equipment has slightly curved, delicate edges, combined with a very modern, futuristic look. Even the colors of white, green and blue are mixed cleanly and appealingly. Disliking the design is impossible. The equipment feels and looks like a new generation design, and it’s novel and simply pretty. In fact, you can combine it with almost every modern home decor. For example, it would go amazingly well with the minimalist style. Like all Nest devices, you can control your Nest Secure home system through the Nest app. That means that you can monitor each sensor, assign names, and activate or deactivate your system all from one security screen. Because Nest Secure is part of the Nest ecosystem, it’s easy to jump from your Nest Secure to the Nest Cam live feed. You can change the temperature on your thermostat and lock the doors, all with just a few swipes. 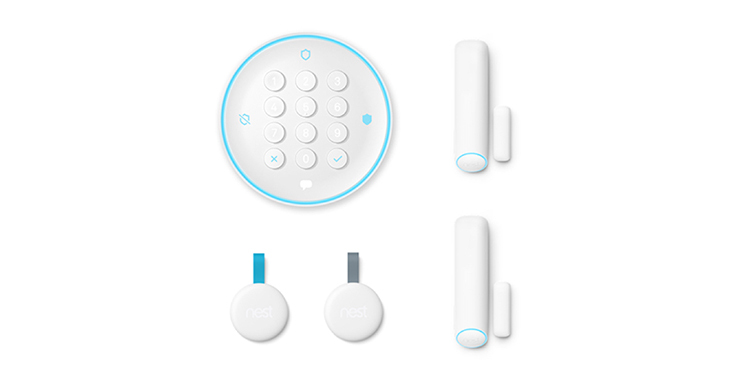 Additionally, the Nest Tag is simple and easy to use. Every time you walk inside or outside your house, all you have to do is use the coin-sized key fob to engage with the security system. You can easily get extra fobs additional users. Scout has a slightly different origin story than the companies in this report. In fact, Scout was invented out of necessity, and it was established with a crowdfunding campaign. According to the Scout website, the idea for a new security system was born when one of the founders went shopping for a security system. Once he evaluated the price-to-value ratio of existing home security systems, he came to the conclusion that he should just invent one himself. By February, 2013, the founders started the crowdfunding campaign, and managed to exceed their funding goal in less than a month. 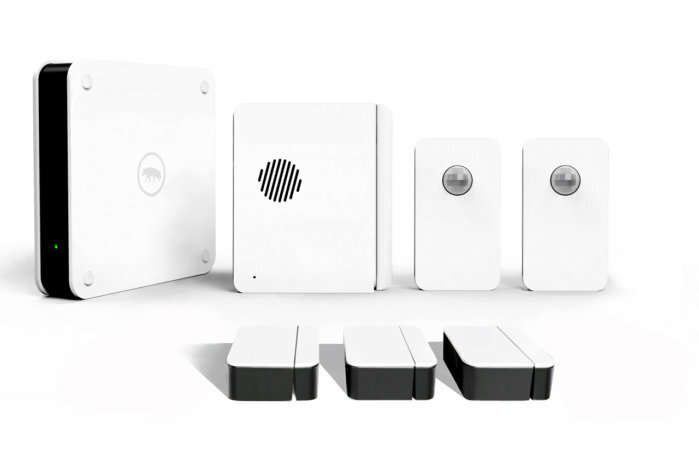 Since then, Scout has sold more than $500,000 worth of home security systems. Their business approach is very flexible and DIY-focused, which means they allow you to create your own package, and you’re not tied into lengthy contracts. One thing that might displease customers is that Scout doesn’t offer plans that cover equipment and monitoring in the same package. Instead, they are entirely separate, which can complicate your estimates. However, you don’t have to sign a contract service agreement, so the hassle may be worth it. We couldn’t officially verify the response time at the time of this report’s publication. As with any DIY home security system that that uses wireless functionality, the installation is rather simple. For most people, it will take between 30 minutes and an hour and a half, depending on your skills and previous experience. The company features some helpful installation videos on the Scout website, where you can also find additional recommendations and installation tips. Award-Winning Monitoring – the emergency monitoring for Scout Alarm is provided by C.O.P.S. Battery Backup – 3G cellular chips in case of power failures. Plus, the systems can run for 24 hours without external power. RFID Stickers – RFID stickers use radio waves for security. Access Sensors – to protect property and privacy. The customer service is one of the strong suits of this company. According to general customer consensus, the company’s representatives are very professional, responsive, and able to help when a problem occurs. You can reach customer service between 9am-6:00pm CST. In fact, the service is available even during almost all major U.S. holidays. Scout devices are more stylish than most. They come in two colors, so you can choose the one that goes best with your home decor. Of course, like every other DIY wireless home security system, it’s easy to place them so they blend well within a room. Scout is very easy to use, especially if you’re a fan of mobile devices. The Scout mobile app works for iOS, Android, and web-based browsers, and it allows you to control almost every aspect of the security system remotely, and it’s highly customizable. Inside the app, you can even control email subscriptions, SMS alerts, or the in-app notifications. Furthermore, the app has a history tab that allows you to review all past alarms and notifications. You can even edit each user’s access and rights to different security system features. Crowdfunding is becoming one of the most popular, liberal and beneficial business models around. We’re opening this chapter of the review with crowdfunding because this is the second company on our list that was established in this manner — Abode Home Security. It’s a new company, on the market for almost five years, but that doesn’t mean that Abode can’t offer what other big companies can. In fact, because of the company’s DIY approach towards home security, you might even get more price/value ratio. Abode was founded in 2014 by ADT exec Christopher Carney, along with the help of entrepreneurs with expertise in energy, security and tech. One of the main selling points for Abode is its high-level integration and support. Their devices can integrate with Nest, Amazon Echo, the Google Assistant, Philips Hue, ecobee, ZigBee and Z-Wave. The base of the company is established in San Francisco, California. By 2018, the Italian tech company Nice S.p.A. (home automation, home security, and smart home industry) purchased a majority stake in Abode. First, we would have to point out that many home security companies on the market are avoiding the standard 36-month monitoring contract. Since most people tend to have issues with cancelation fees and procedures, the new companies in the industry avoid them. Instead, they focus on a slightly different method — monthly payments. 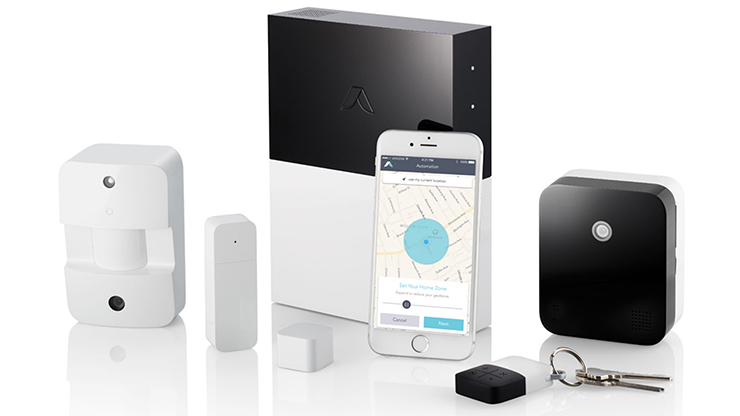 We couldn’t officially verify the response time of Abode Home Security. However, according to customer reviews is less than 20 seconds and the responsiveness of the whole system is timely and efficient. As with any wireless DIY home security system, setting up the whole equipment (depending on the package) should take less than an hour. The good news is that the package arrives at your home with a set of instructions, which are extremely clear and easy to understand so that you can be guided through the process step by step. However, if you have problems with the installation, you can always contact the company and arrange for a professional setup. Smart home features – several devices like smart lights, Philips Hue, various switches and door locks can be incorporated and controlled with the Abode app. Remote Control – you can have complete control over the security in your home, even if you’re not there. High-level Integration with Other Devices – Abode integrates with Nest, Amazon Echo, the Google Assistant, Philips Hue, Ecobee, ZigBee and Z-Wave. Automation Software – you can set up triggers and schedules. Abode seams to be one of the favorites in this regard. Customers love the DIY approach and the high functionality and quality of the equipment. Also, most of the customer service reviews focus on feedback, like how professional the company is and the high level of problem-solving customers have encountered with the service. However, one issue of concern is issues with timely shipping and shipping delays. Abode equipment is clean, simple, and rather pretty to look at. However, the boxy design might not be everyone’s cup of tea. The devices come in white, black, or a combination of both. Using and maintaining the Abode home security system is rather simple and easy if you like controlling everything through your phone. Although, before the Abode app is truly functional, you might need to adjust a few things from your laptop. That’s because some functions can only be done from the web app, but once you set everything there, you can continue with the mobile app without any additional issues. How important is home security & automation when moving into a new home? In a 2018 survey conducted with over 500 participants across the US who recently purchased and moved into a new home, we asked them to rank which tasks were most important when moving into their home. What are the most important factors to consider when choosing a home security system? What features are most important for my home alarm system? That wraps up our list of the top 10 best home security systems in 2019! We hope that this report made it easier for you to pick the right home security that will best suit your needs in protecting your home and family for years to come.